A few miles away, near the Glaslyn osprey nest, there’s a natural rock shelter, protected by an overhanging cliff. A friend was climbing there one Christmas Day when he noticed a limpet shell in a crevice ten or more metres above where the sea would have been before the Cob. How did it get there? Limpets from three different sections of the site have been carbon dated to 7379, 9281 and 9349 years ago. Other shells have been uncovered as well as cockles, mussels and oysters and remnants of hearths where stone age man may have steamed his Fruits de Mer. A particularly Mediterranean version with mussel shells from a warm water species never before found in Wales. In amongst the shells are pieces of bone, probably from deer, which suggest that this was a temporary shelter for hunters on an expedition. How the shells and bones have remained in tact is a stroke of good fortune. 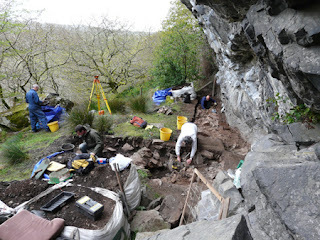 The natural acidity of the soil in much of north Wales would have caused them to disintegrate but the overhanging rock leaks lime thereby changing the chemistry and preserving the relics. 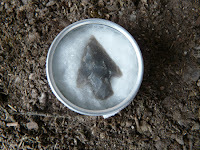 Over forty worked pieces of flint have been found and at the end of the dig this April a perfectly formed flint arrow head, probably from the bronze age. 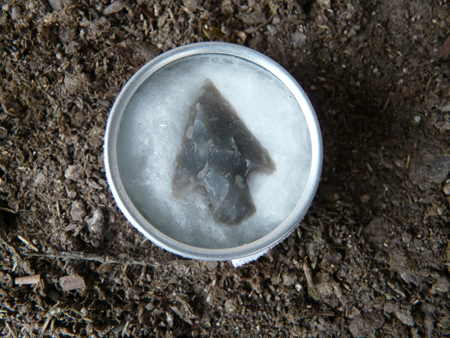 If this is the case, then it looks like the rock shelter was used over a period of at least 5000 years.